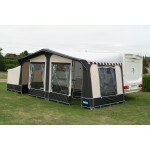 This 1050 Tuscany awning offers many features, which have never been available before at such an affordable price. As well as having all the advantages of a 5-piece awning, the new quick lock and release poles make this awning a breeze to erect. They come complete with the quick fit caravan pole pads so no drilling of the caravan is required. Awning security kit buckles are an extra feature on all Tuscany awnings. It has a 280gram coated patterned roof. Draft skirt and wheel arch covers are included. All the front and side panels are removable. Annexe available for either right or left hand side fit. Depth 240cm.